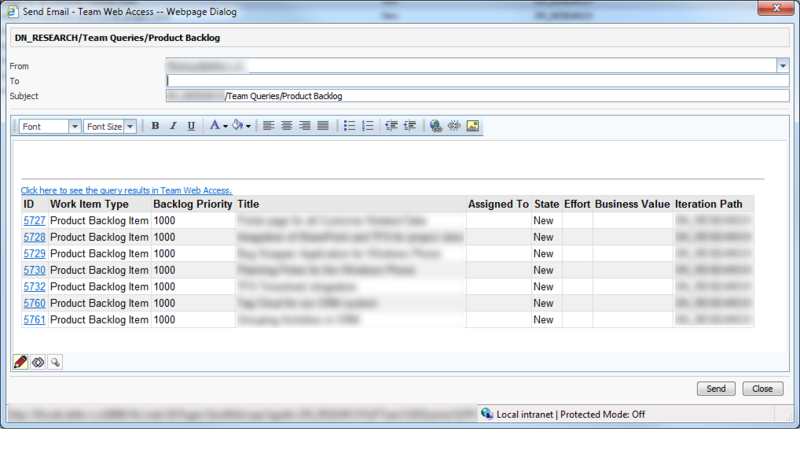 When working with work items, sometimes it is useful to send the results of a work item query to other people. Even people from outside of your development team. For example the customer wants to know the status of his bugs and does not have access to your systems. In this case you can use the mail functionality of TFS 2010. You can either use the Web Access Client or Visual Studio to send your emails. Go to your web access client. http://tfsserver:8080/tfs/web and navigate to the Work Items Tab. A pop up window appears with all the work items. Here you can add email adresses and additional text. Press Send to send the list. 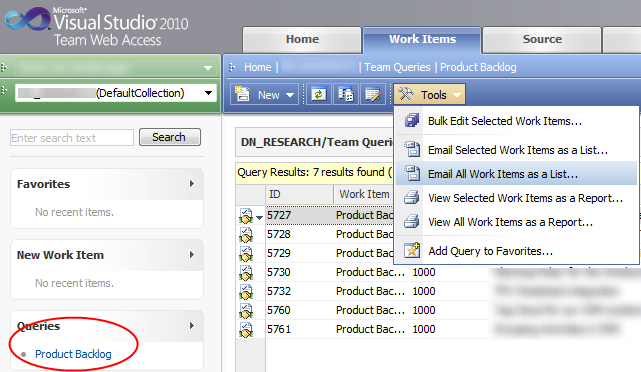 In the Query Results Press Open in Microsoft Office and choose Send Query to Outlook. When sending a single work item per email from the Web Access Client, it sends much more details then when sending a single work item from Visual Studio, they don’t use the same template. Anything we can do about that? You can try to modify the XSL and workitem.aspx page in C:\Program Files\Microsoft Team Foundation Server 2010\Application Tier\Web Services\_tfs_resources\WorkItemTracking on the TFS Server. The WorkItem.aspx page includes a control that generates some XSL. In the v1.0 dir there is a xsl that can format this xml. I never tried it but it may be an option. Another alternative is write your own soap event handler that sends an email with everything you like. Some examples are here http://blog.hinshelwood.com/tfs-event-handler-in-net-3-5-part-2-handling-team-foundation-server-events/ I plan to write some blog articles about this as well when time allows it.